Single in Seattle? Welcome to the Pacific Northwest, the home of so-called Seattle Freeze. The truth is you can beat the Seattle Freeze very easily by using "Seattle Freeze" as a conversation starter. Try it. Seattle men are kind of different, they tend to be shy and timid. Going out to a bar or hanging out in a coffee shop may be the fastest way to meet single men. But if you are looking for a deeper connection try meeting singles through fun activities. 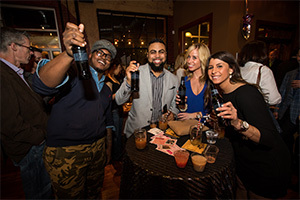 The Fun Singles events are aimed to connect single women and single men through fun events and activities. This is also a good way to meet new single friends and extend your social circle. Oh men, let's talk about facts: Seattle is a tech city with huge corporations such as Amazon, Facebook, Google, Microsoft and more are coming. It's reasonable to assume that Seattle dating scene is transformed by these male-dominated tech companies. This brings us to a bad news/good news conclusion. The bad news is there's a lot of competition and the good news is you could be ahead of the competition by being just a little bit more social and outgoing. The Fun Singles events want to help you exactly with that, we provide you an opportunity to meet and socialize. Pick an event that suits your personality and start meeting single women.